Each condo at Sonenalp has a large storage locker available for guests. Your condo code will open this locker. Locker storage space varies, but most can accommodate items as large as several bicycles. The Refined Rustic Retreat locker has snow sleds and 2 kayaks for your use. If you use plan to use the kayaks, please read safety and preparation info here. 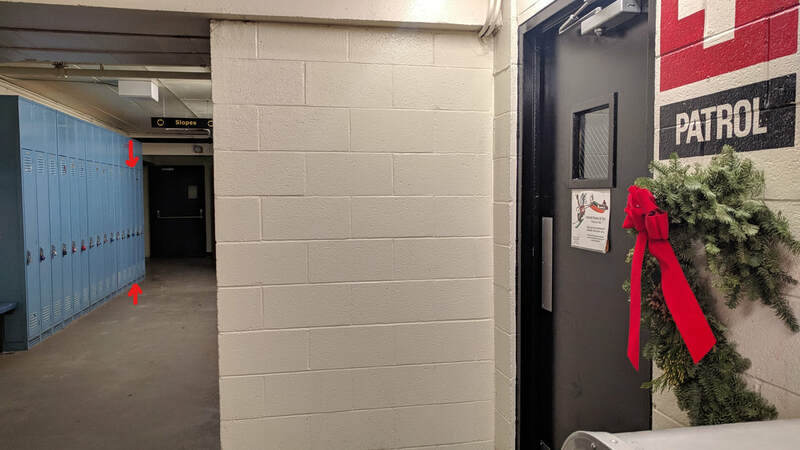 Lockers are located just inside the pedestrian door from the garage, at the base of the central stairwell. The Refined Rustic Retreat also comes with complimentary use of our family's Canyon Lodge locker. This standard-sized Canyon Locker is about the same size as an old high school locker. We can get our family's 6 sets of skis, poles and helmets in with some careful loading. We always keep our boots at the condo because we don't like cold boots and the locker gets cold at night. We usually drop our gear in the locker the night before we plan to ski/ride. That way, we don't need to waste valuable mountain time bringing in equipment the next day. We just put on our snow boots, walk up to Canyon, and change into gear at the locker. The locker is located close to the ski patrol office, on the ground floor of Canyon Lodge. The locker number and lock combination are available in the password protected pages of the Guest Guide.